-We pick you up from your hotel/hostel with our luxury vehicles (Mercedes Sprinter or Vito) and take you our launch site in the early morning. -While you have your open buffet breakfast which includes coffee/tea and snacks,we prepare the balloons on the ground. You will have an opportunity to watch. The preparations take just 15 min. -At around sunrise,our balloons begin to take off. - The Deluxe tour uses a smaller 10-12 person capacity balloons. This deluxe tour is great for those seeking a more comfortable, intimate setting for their experience of a lifetime. -At about 8 am,our minibuses will take you back to your hotel/hostel. -We pick you up from your hotel/hostel with our luxury vehicles(Mercedes Sprinter or Vito) and take you our launch site in the early morning. - The Standard tour uses a 16-21 person capacity balloons. This is a great option for those travelling on a budget. -Upon landing,we have a champagne toast service for you. -At about 7 am,our minibuses will take you back to your hotel/hostel. -Your entire balloon adventure lasts about 2 hours. Where do we fly : We change our take-off site everyday according to wind speed and direction. 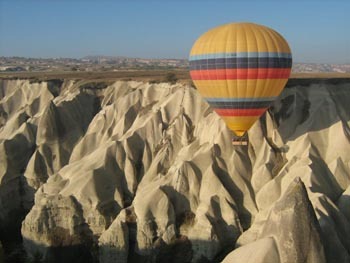 So, we can show you the most charming valleys and hills of Cappadocia. What should I wear : You should wear long trousers and tops with long sleeves, preferably made from natural fibres and suitable footwear for an outdoor oursuit. Having layers is a good idea as it is cold at the beginning and warmer later. How high up do we go : Even though we will be flying very low for a while and pick fruits from the trees sometimes, we always go up-to 500 meters from the ground. When the wind is calm, we go higher than 1.000 meters. Can children fly : Children not younger than 7 years old can fly with a responsible adult. They will have 50% discount up-to 12 years old. However, we are unable to fly children under 7 years. Can I fly any time of the year : Yes, we fly 12 months. However, from October to March, there will be more cancelations due to weather conditions. When do you cancel the flight : When the ground wind is faster than 10 knots, during heavy rain or fog, the flight will be canceled. You will receive a full refund if we have to cancel your flight. How far do we travel : It can be between 4 to 20 km depending on the speed of the wind on the flight day. Can pregnant women fly : No. If you are pregnant or think that you might be pregnant, you shouldn’t fly with ballons due to possible bumpy landings. Is the landing bumpy : Occassionally. We usually land very calmly but if the wind increases on landing there will be a bump and the basket will drag on the landing field until it comes to a halt. When do we meet for the flight : We will pick you up from your hotel about 45 minutes before sunrise and drive to our office for check-in and breakfast. 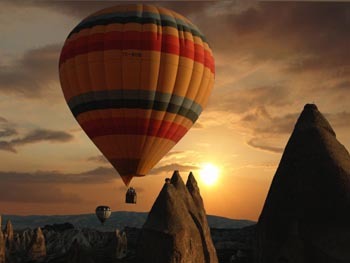 Do we see sunrise from the balloon : We usually take-off with the sunrise and fly during the Golden Hour for photography. Sometimes, we might have to take-off later due to weather conditions. Why do you fly so early in the morning : The wind is not very fast, there are no thermals yet and it is not too hot. How do I go back to my hotel : Our minibuses will be following the balloon during the flight and will drive you back to your hotels after the landing party. How big are the baskets : We use Cameron TT baskests with different sizes. They have 4 compartements for the passengers. There will be maximum 4 people (3 people on Beyond Flight) in your compartment. The height of the baskets are 120cm. Where are your balloons made : All our balloons are made in England by Cameron Balloons in year 2010 and 2011.